For Buckeye Bread Loaf, Ohio’s Chapter of BLTN, 2017 has been a year of revitalization. Currently, the Promise of Learnings, Inc. (POLI) supports eight Ohio teachers to attend Bread Loaf in the summer through Bickimer Fellowships. 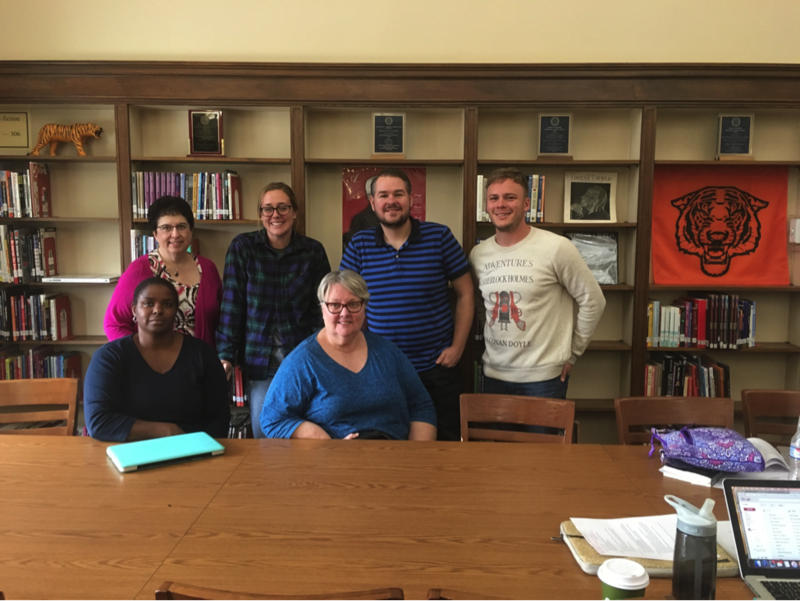 During the summer and throughout the school year, these Bickimer fellows are working, along with a group of Ohio BLTN alumni, to facilitate networked exchanges across their classrooms. In the past year, Ohio BLTN members have focused their energies into a range of collaborative projects centered on giving the group a shared mission and sense of identity as well as empowering students to positively impact their communities. The national news continually reports that Ohio is one of the hardest hit states in the opioid crisis, a public health emergency that has especially ravaged rural families and communities. 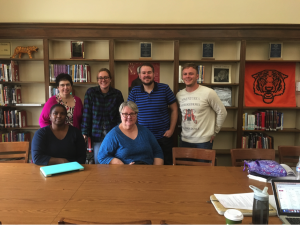 Judy Ellsesser, BLSE 2002, who teaches at South Webster High School (Bloom-Vernon Local Schools) in southeastern Ohio, has mobilized her classroom to respond to this crisis. In a collaborative unit developed with social studies teacher Cyndy Hykes, Judy’s junior AP English language and composition students, as well as her dual enrollment college-level freshman composition students, read Sam Quinones’s Dreamland: The True Story of America’s Opioid Epidemic. They also engaged with outside speakers—a judge, a state representative, a fire chief, a school principal, and even Quinones himself via Skype—to learn about outside factors shaping the crisis that has swept across their community. After exploring the opioid crisis through several lenses, students were ready to work collaboratively through a problem-based learning framework to formulate solutions and put them into action. Judy’s students have taken up the tools of change to write to their elected officials and develop TED Talks, and they have also developed a Big Buddies program in which high school students mentor younger at-risk students in order to create a sense of belonging, provide positive role models, and promote unity within the community. Cyndy and Judy’s work has earned many well-deserved accolades. It has been picked up by the national press in recent articles in The Huffington Post and NPR. But, according to Judy, the most rewarding part of this collaboration is to see her students realize they are neither helpless nor hopeless. With its student-driven, empowerment-minded, social action focus, Cyndy and Judy’s unit highlights the best pedagogies that comprise the foundation of BLTN exchanges. As Cyndy and Judy’s project illustrates, the best BLTN exchanges are timely—they often originate out of real needs in students’ communities. Applying this principle more broadly, a group of central Ohio BLTN teachers has decided to collaborate on a topic of significant social importance: using the English classroom to repair public discourse. All around us America’s political and social climate is growing more and more toxic. In order for a healthy democracy to thrive, a country’s citizens need to be able to talk with each other substantively, deliberatively, and thoughtfully about issues that matter. Since adolescents are formulating their own views of the world, high school is a pivotal time to teach students about the importance of these public discourse conversations. Ohio’s reputation as a political bellwether state makes this topic perfect for Ohio BLTN exchanges. Three groups of teachers have developed exchanges in which students engage meaningfully about public discourse issues with communities outside their own, ranging from a rival high school to a school on the other side of the country. As teachers, our obligations in guiding students into these conversations is two-fold: students not only need to learn about the importance of valuing other voices in the conversation, but all of our students need to feel like their voices are of value to the conversation. These exchanges are designed to teach students to develop a feeling of authentic value for self and others when interacting with people of different backgrounds. 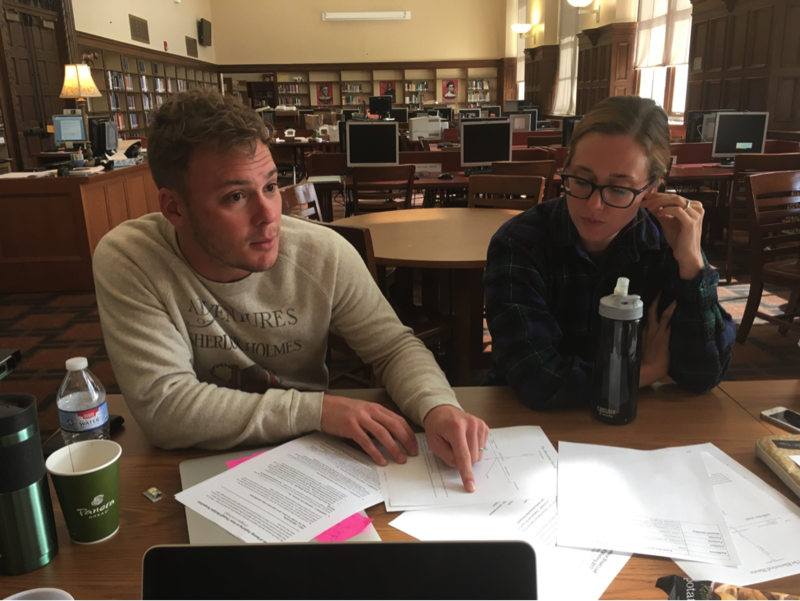 Andrea Vescelius and Chris Moore (BLSE 2013) have been networking their senior AP English language and composition classes in exchanges centered around argumentative writing since 2011, but in this past year, they reframed this exchange to address the issue of public discourse. Collaboratively reading and discussing George Packer’s The Unwinding: An Inner History of the New America, Chris and Andrea’s classes from rival high schools in the Olentangy school district outside Columbus took part in deliberative conversations, via online forum, about the current state of political and social affairs in America. 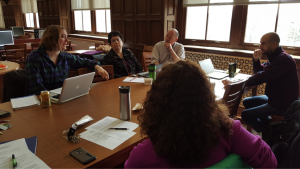 Chris, who teaches at Liberty High School, and Andrea, who teaches at Orange High School, facilitated reflective discussions in class to supplement the conversations taking place on the online forum. Using students’ perceptions of the rival high school as springboards, students from both schools engaged in discussions about assumptions made of others when discussing controversial topics, particularly when such discussions take place online. Laura Swetnam, fellow AP language teacher at Liberty High School, also involved her students in this exchange. Over the course of the exchange, Andrea, Chris, and Laura brought samples of student posts into their classes, asked students to analyze and evaluate those posts to define the moves of productive discourse and effective argumentation, and pushed students to improve and deepen their conversations in subsequent rounds of posting. Their goals for the exchange were for students to become more attuned to the effects of their language, to gain empathy for an unknown audience, and to approach discourse in a way that prioritizes productive conversation over winning at all costs. Whereas Andrea, Chris, and Laura connected students across a school district, Amelia Gordon and Derek Burtch, both currently enrolled in classes at Bread Loaf, engaged—and are currently still engaging—their classes in a year-long exchange across a metropolitan area. Amelia, who teaches at South High School in Columbus City Schools, and Derek, who teaches at Liberty High School in Olentangy Local Schools in a suburban district, have involved their freshmen in an exchange called Erase the Space, which is designed to break down the racial, socioeconomic, and ideological walls that often exist between inner city and suburban schools. 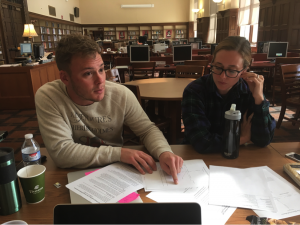 Derek Burtch and Amelia Gordon explain the rhetorical matrix they designed to help their students understand how risk and audience play a role in crafting writing. Photo taken from the Buckeye Bread Loaf Fall 2017 meeting, October 21, 2017. Partnered one-to-one between classrooms, Derek and Amelia’s students wrote letters and opinion pieces to introduce themselves, then discussed articles about urban segregation via Twitter and Google Hangouts, and ultimately met up in person on a field trip to the Columbus Metropolitan Library. At the in-person meeting, students formed teams and were tasked with proposing projects to erase the divide that exists among Columbus area communities. Seizing control of the momentum, students dove into the work at hand, collaborated enthusiastically, and generated project ideas ranging from a cross-community teen music festival to a coffee shop event, worked by teens from across diverse Columbus area communities with profits going to aid the area’s homeless. The first exchange between Amelia and Derek’s students was so successful that they are currently planning a two-day retreat for last year’s participants to come together with the goal of putting their project ideas into action. Amelia and Derek are also conducting a similar exchange with this year’s freshman classes in the hopes of creating a collaborative model that can spread beyond the walls of their respective schools. Erase the Space plants the seeds of improving public discourse by teaching students to interact with people of different backgrounds and experiences with empathy and respect, fostering student-driven collaboration to solve social problems, and providing real-world instruction for communicating effectively in the workforce and as citizens. While Derek and Amelia have been working to erase the spaces between communities within a metropolitan area, current Bread Loaf student Gregory Booth has been attempting to bridge even wider spaces—both geographical and cultural—in his exchange with Pierre Carmona. Greg, who teaches at Sheridan High School in Northern Local Schools, a rural district about 45 miles outside of Columbus on the outskirts of Appalachia, involved his sophomores in an exchange with seniors from Pierre’s classes at San Francisco University High School, an elite private institution in the heart of downtown San Francisco. Titled Between America and Me, this exchange was created in the wake of the divisive 2016 election. Its primary goal in bringing together classes from extreme red and blue environments was for students to develop empathy for a perceived other through the lens of collaboration around the questions of how they view America and their communities. Beginning with a chalk talk about what defines America, which elicited vastly different responses reflecting predominant political ideologies of each student’s community, Greg and Pierre used their exchange to help their students understand worldviews of people with different backgrounds and experiences. After reading James Baldwin’s The Fire Next Time and Ta-Nehisi Coates’s Between the World and Me, students wrote letters to Coates and to students from the other school about what came “between the world and them.” These letters were shared between classes. 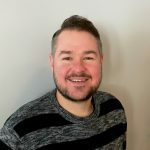 Greg believes that the centrality of narrative was crucial to the success of this exchange. Perhaps stories represent a path to healing our nation’s public discourse rift; research has shown—and Greg and Pierre’s exchange supports—that narratives tend to spur empathy to different worldviews, perhaps more so than issue-driven discourse. This exchange was powerful because Greg and Pierre’s students experienced and responded to each other’s stories and learned, in the words of one of Greg’s students, that “despite a three thousand mile distance, we are more similar than different.” Greg and Pierre are continuing their exchange with this year’s students, bringing in readings that represent their own communities, such as Vanessa Hua’s Deceit and Other Possibilities and J.D. Vance’s Hillbilly Elegy, to further leverage the power of story in helping students engage more thoughtfully in civil discourse. Chris Moore, Andrea Vescelius, Amelia Gordon, Derek Burtch, and Greg Booth pose for a picture after giving their panel presentation, “Erase the Space: Teaching Productive Public Discourse in the 21st Century,” at the 2017 NCTE Convention in St. Louis. 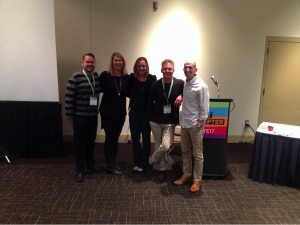 In November, Andrea, Chris, Amelia, Derek, and Greg represented Buckeye BLTN by sharing their exchanges in a panel presentation at the NCTE Convention in St. Louis. Titled Erase the Space: Teaching Productive Public Discourse in the 21st Century, the presentation was received enthusiastically, receiving feedback from participants that echoed Dixie Goswami’s frequent calls to publish. Participants prodded the presenters to write about their exchanges and emphasized how much this work needs to be shared with the larger teaching community. Buckeye Bread Loaf members discuss their upcoming projects related to public discourse at the Spring 2017 meeting, March 4, 2017. It is truly a testament to the sustainability of the BL model that I can come together with people who were not even among my cohort group, and we are all still on the same wavelength. Just look at the factors that COULD count as separators: the fact that we had not previously known each other or worked together, the disparity in age, and the geographical and cultural separations. Yet we all came together and immediately fell under the BL spell of collaboration, communication, and conviviality! It is just an amazing thing, this Bread Loaf. We look forward to continued collaboration and inspiration as we continue to grow Buckeye BLTN, hopefully bringing more and more of “the mountain” into the heartland.